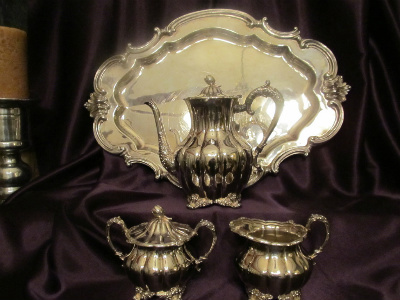 We are offering a lovely Antique Silverplate Meriden Brittania Melon Tea or Coffee Service paired With Reed And Barton Victorian Style Tray. 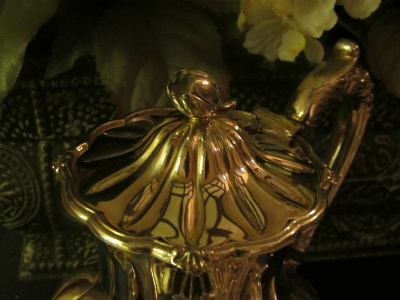 The Antique Silverplate Meriden Brittannia lidded tea or coffee pot, lidded sugar bowl and cream pitcher were produced in the beautiful melon blossom design. 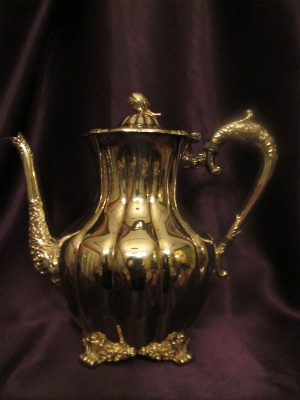 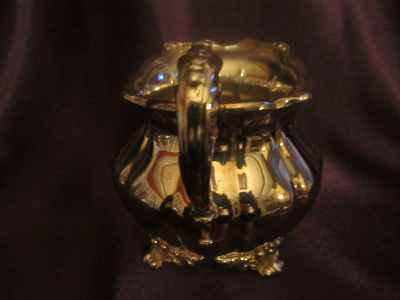 The shape of the Antique Silverplate Meriden Brittania pot makes it appropriate for either tea or coffee service. 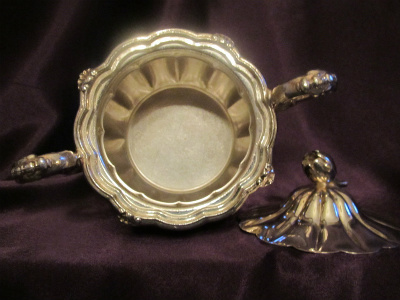 We paired the Antique Silverplate Meriden Brittania Melon Tea Coffee Service with a Mid-Century Reed And Barton Silverplate Victorian Style Tray. 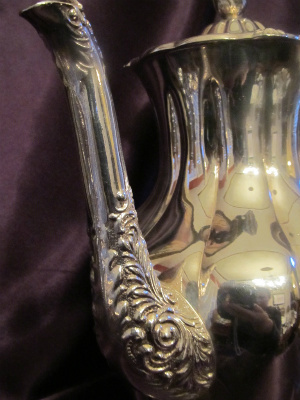 The three pieces of Antique Silverplate Meriden Brittania feature the combined hallmarks of the esteemed Meriden Brittania Company, inclusive of its scales-in-shield design, and the International Silver Company, which leads us to believe that this antique silverplate tea service dates from approximately 1898. 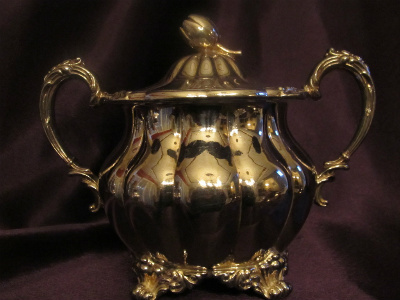 We have reached this conclusion because Meriden Brittania joined with a number of other silver companies to form the International Silver Company in 1898. 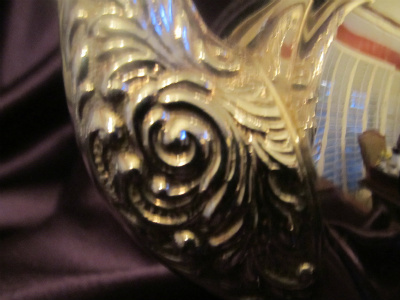 Although Meriden Brittania would have been one of the more notable companies participating in this merger, it is not likely that its name and hallmark would have been used in conjunction with the International Silver hallmark much beyond the 1898 merger. 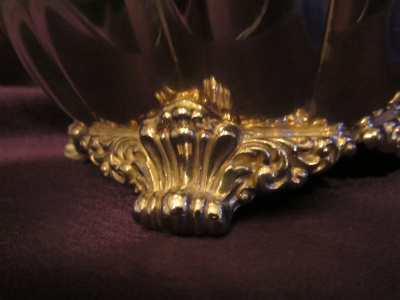 One Large Mid-Century Reed And Barton Silverplate Victorian Style Tray which measures 21-3/4" in length and 15-1/2" in width. 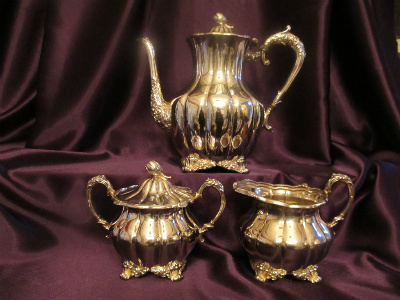 The Antique Silverplate Meriden Britannia lidded teapot / coffee pot, lidded sugar bowl, and cream pitcher stand on four ornate feet and boast ornate flourishes and pediments that offset the simplicity of the melon shapes. 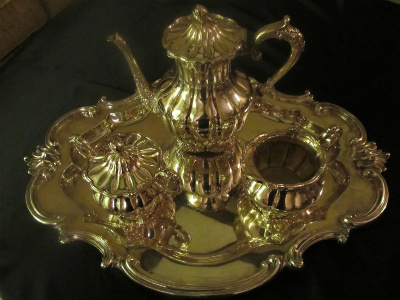 This Antique Silverplate Meriden Brittania Melon Tea Coffee Service did not come with its own tray. 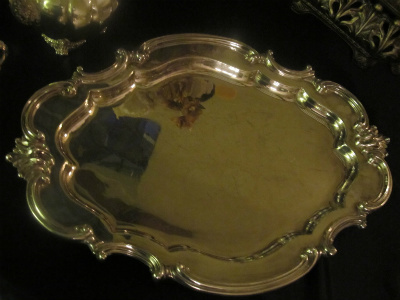 We teamed it with a beautiful and substantial Victorian-style silverplated tray which was produced by Reed & Barton in 1950. 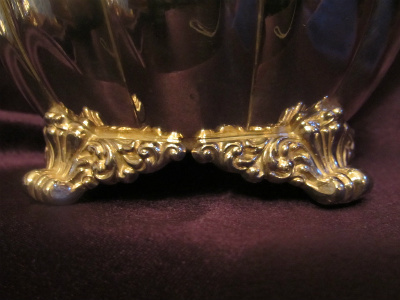 Although the vintage Reed And Barton Silverplate Tray is not nearly as old as the Antique Silverplate Meriden Brittania Melon Tea Coffee Set, we believe that this tray's 60+ years have given it sufficient 'gravitas' to provide the perfect background for the lovely tea set. 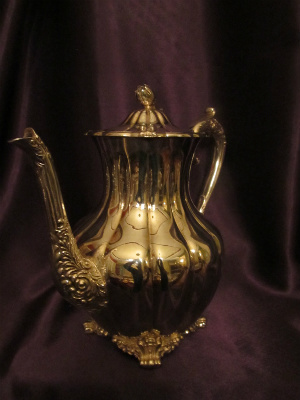 Our beautiful Antique Silverplate Meriden Brittania Melon Tea Coffee Service is in very good estate-found condition as seen in our photographs, with no dents, cracks or repairs, and with no areas where the silver plating has worn away. 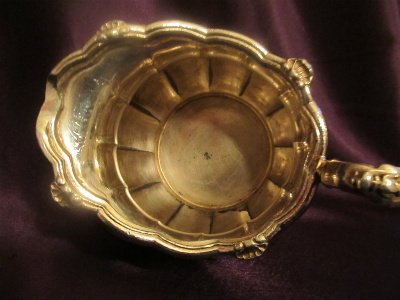 Similar to most trays, our Mid-Century Reed And Barton Silverplate Victorian Style Tray has enjoyed significant use and sports a few scratches on its surface, although none that expose the underlying metal. 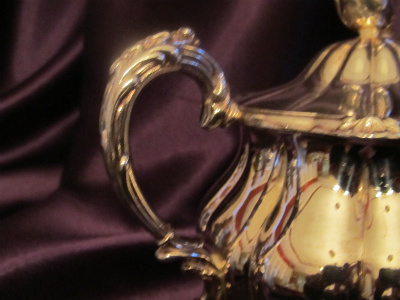 The person who purchases this Antique Silverplate Meriden Brittania Melon Tea Coffee Service With Mid-Century Silvplate Reed And Barton Victorian Style Tray will be delighted when he or she sees the quality of the pieces, and their exceptionally good condition! 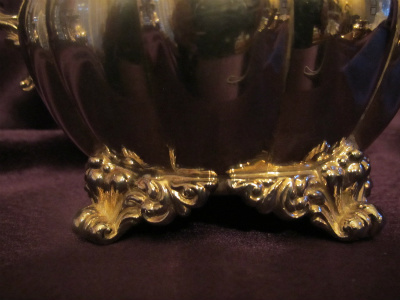 Remember...there isn't a house, a dining table, or for that matter, a grand piano that doesn't look richer and more elegant with silver!